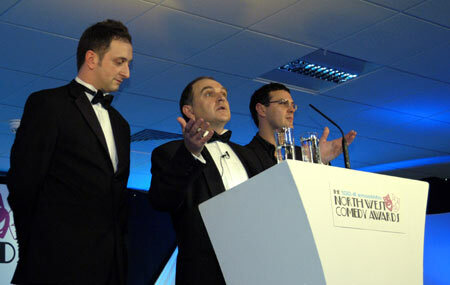 Q: You're presenting The North West Comedy Awards later tonight. It's about time we had an awards show which showcased the talent up in the region. After the likes of City Life Comedian of the Year have been profiling up and coming talent for the past few years, it's about time we had a show which showcased the real success stories? Archie: ...no, Sam Fox and Mick Fleetwood are hosting it next year apparently. I think it's a nice idea to give something to the comedians up here, but are we nominated for anything? The On The Bandwagon Tour never got shortlisted even though we did a sell out tour and we're doing another tour which is selling out it didn't hold any sway with the judges. But we're not bitter are we. Q: So is there an On The Bandwagon DVD in the pipeline? Q: I guess there's a friendly rivalry between the four (including Janice Connolly who wasn't present on the night) of you? Archie: We're all so completely different there is no rivalry. That's what I enjoy about doing this tour - is the fact that we're all completely different and nobody's stepping on anyone else's toes. Paddy: It's impossible to tour if you don't get on. It would just be a nightmare, we wouldn't have done a second tour. We're on the second leg and we're enjoying it and hopefully there will be a third one.